This book is a parody of the women's magazine Cosmopolitan. 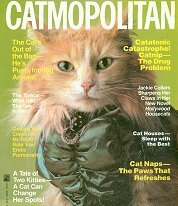 There are articles about "getting your claws into mr. right", "he's pussyfooting around" and "cat naps-the paws that refreshes". There are ads for nail products by Siamese Hansen, polish remover by Catex and makeup by Mewbelline. There is even a centerfold of Burmese Reynolds. This 8 1/2" x 11" softback contains 96 pages. Copyright 1987. Previously owned but in good condition.